If you are looking for a peaceful, private accommodation, Teresa apartment is the right choice! Located in the traditional village of Zola on the hillside overlooking stunning Myrtos and Agia Kiriaki bay, surrounded by nature, is ideal for couples and solo adventurers alike. Whether you are looking for a relaxing place with nice sea view or outdoor activities, snorkeling, boat rides, hiking and many more then this is for you. Teresa apartment consists of a bedroom with queen size bed, separate kitchen and private bathroom. It also has a great patio shaded by a pergola and full access to garden and driveway parking. Besides the queen size bed there are also 2 bed side tables, a wardrobe, and coffee table. Equipped with kitchenette, dining table, refrigerator, cooking utensils and serving sets for a self catering stay. Guests have full access to the apartment and its patio. There is another rental on the premises, a villa for 4-6, with access to the backyard, driveway and garden so some interaction with other guests is to be expected. Zola is a lovely village quite high in the mountainous north of Kefalonia. Tha apartment is well equipped, inside and outside. There is a terrace at the front overlooking a lovely beach and the mountains above. The garden area has a selection of Mediterranean plants and there is a small vineyard just in front of the terrace both of which add charm to the property. There are chairs and a table on the terrace and sun beds just below where you can sit in the sun or in the shade of a tree. 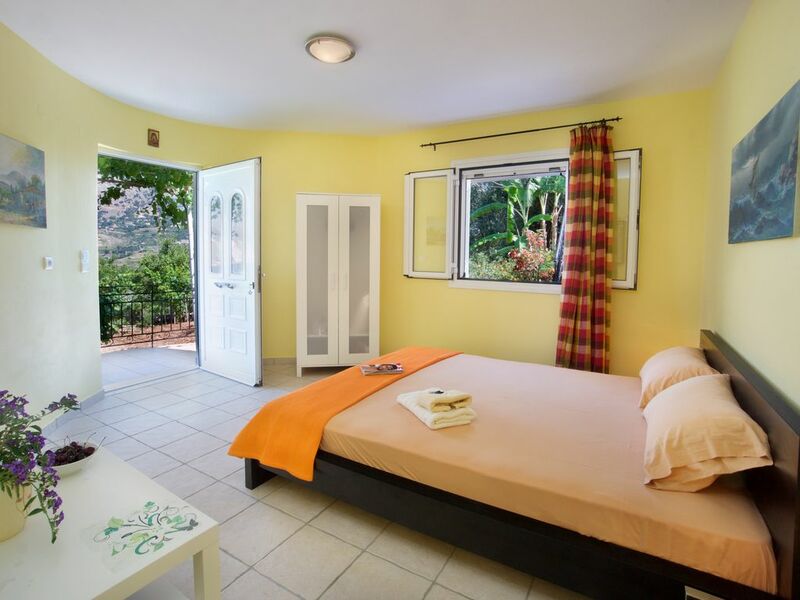 There is a friendly taverna with good food behind the property which is accessible via steep steps or it is possible to drive through the village. Note; it is closed from mid October till May. A car is necessary to get to the beaches in Zola, to visit further places and for shopping. The roads are through the mountains with steep cliffs above and below and hazards include rocks that have fallen onto the road and goats. Nikolas and Dionysia are charming, friendly and helpful and the welcome pack contained home made jams(fig, apricot), olives as well as other local treats and the basics. This was a truly enjoyable and relaxing week. Thank you so much for your kind words. We are glad you enjoyed your stay in our appartment. You are a really lovely couple and we're looking forward to seeing you both again. The apartment overlooks a beautiful stretch of coastline including the local beach. We enjoyed breakfasting on the lovely shaded patio and relaxing in the butterfly-filled garden. Zola is a pretty little village in a good location for exploring Cephallonia, and close to the Myrtos Beach. Everything was very clean and well looked after and Dionisia and Nikolas were generous and helpful hosts. Thank you Zena for your kind words! I'm really glad to met you because you are a very interesting and very friendly person. Hope to see you again! Dionisia en Nikolas zijn fijne gastvrouw en gastheer. Het ontbreekt je aan niets. Hele fijne mensen en dat voel je aan de sfeer in en rondom het huis.Verbluffend mooi uitzicht, heerlijk terras, kortom een aanrader. Net geland maar onze gedachten nog daar! Thank you Susanne for your kind words. We are very glad you enjoyed your stay in our property and in the island. Hope to see you again soon. Ho soggiornato con il mio compagno nel mese di maggio 2018 nella casa di Dionisia. Tutto sorprendentemente perfetto al nostro arrivo. La casa dispone di ogni confort dal phon al bagnoschiuma, shampoo, dentifricio e spazzolini, al caffè e caffettiera... ma soprattutto la dolcezza di Dionisia nel lasciare spezie tipiche, ciliegie raccolte dall’albero, limonata pronta, vino locale e marmellata fatta in casa... insomma, appena si entra si assapora l’amore e il relax che l’ambiente circostante rilascia con i suoi profumi e colori. Una nota per i prossimi ospiti: il navigatore vi porta ad una via vicino, voi dovrete seguite per Villa Teresa che altro non è che il nome di questo fantastico appartamentino. Grazie Laura per le tue gentili parole. 'E stato fantastico averti come ospite e incontrare personalmente entrambi! Siamo molto lieti che avete gradito il vostro soggiorno e speriamo di rivedervi! There are local companies that can provide you with a lot of outdoor activities.